Hey all! 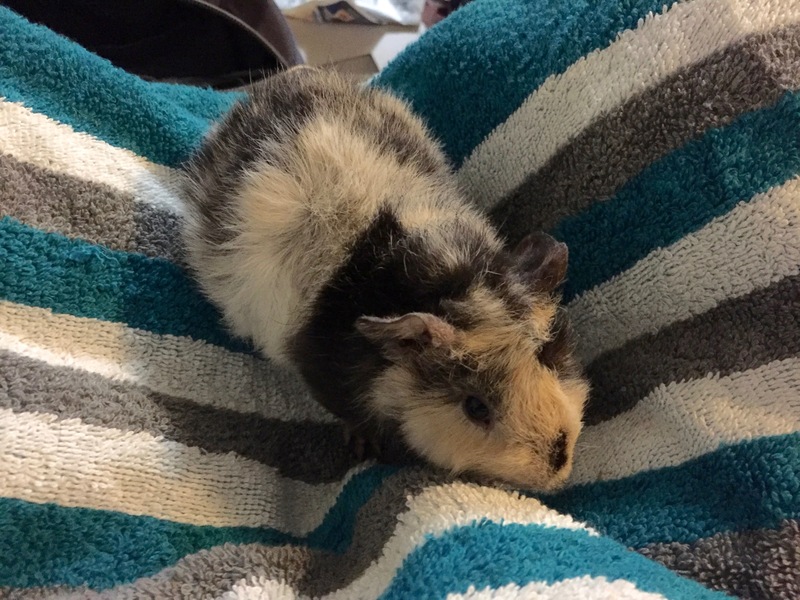 I love talking about my guinea pigs, this seemed like a good place to ramble about them for a while. Note: I will be making several posts in a row, because there is a max of 10 urls per post, and I want to share more pictures than that! They did well together in their new home, clearly not a bonded pair but not aggressive towards each other. Opal was clearly the head honcho of the two. 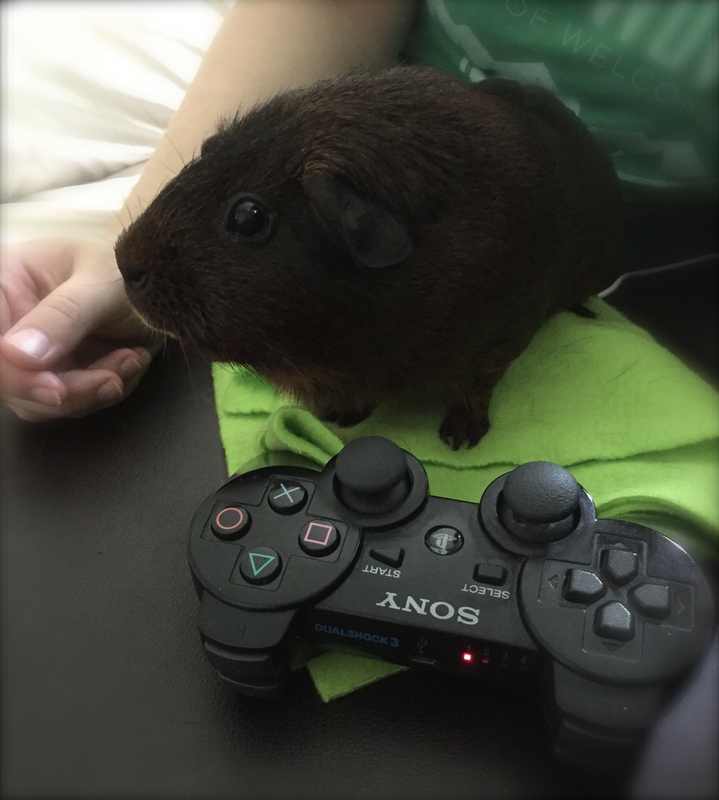 She was a very clever pig, thwarting my attempts to get her to eat a vitamin c tablet every time. When I ground one up into dust and sprinkled it on wet lettuce, she waited for it to dry and brushed the dust off. Such determination not to eat it! Unfortunately, only a few months after I adopted them, Opal passed away of a severe respiratory infection. Chainsaw was definitely not fond of being a single pig, and despite my efforts to keep her company Chainsaw was still lonely. She started chewing on the bars, I believe out of stress. 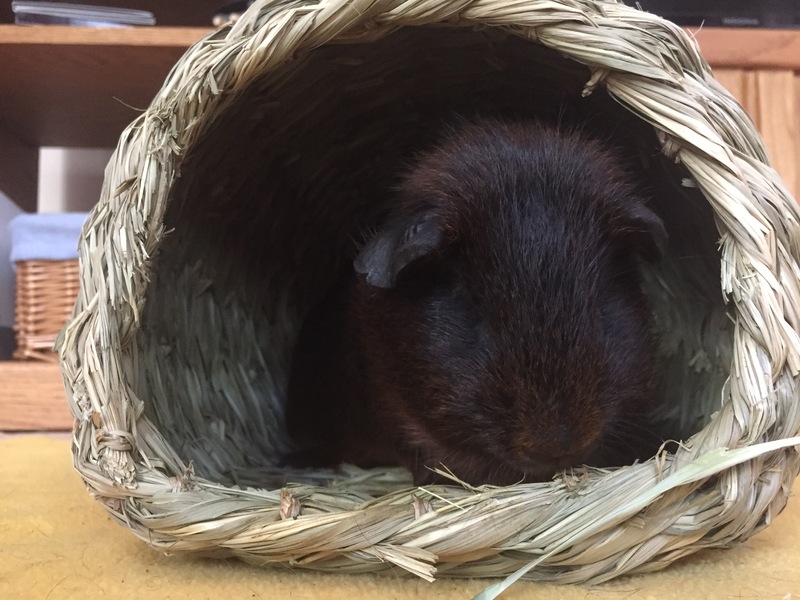 I watched every shelter or rescue in the area for a suitable cage mate, but there wasn’t a single guinea pig available for adoption for several weeks. 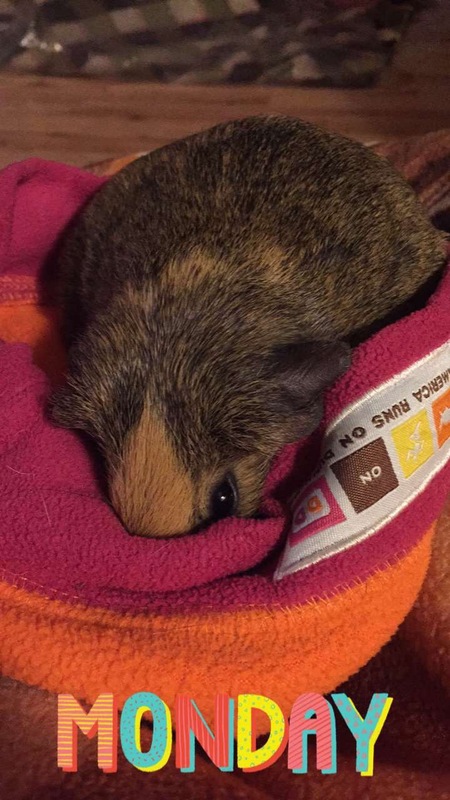 I eventually came across a breeder who had 2 month old female guinea pigs, and I ended up coming home with one (After a long conversation where the breeder and I subtly interrogated each other to see if the other knew how to properly care for a guinea pig!). 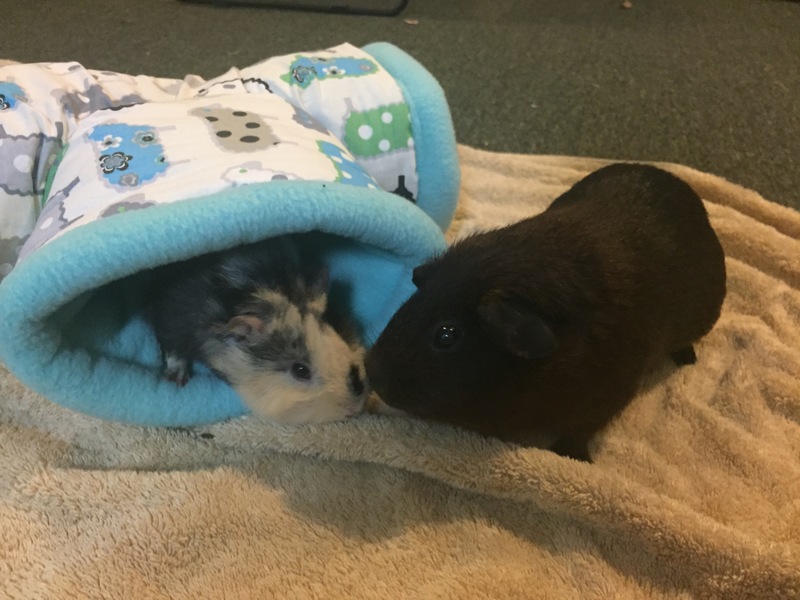 The new baby was named Trinket, and after some quarantine and a vet visit, introductions began. Though they weren’t bosom friends immediately, Chainsaw and Trinket were soon inseparable. I could barely take one into another room for a minute before they’d start calling for each other! Due to Trinket being a baby, Chainsaw became the new Boss of the pig pen. Things were good for the next few months. Chainsaw and Trinket’s friendship continued to solidify, and Chainsaw stopped chewing on the cage bars within days of Trinket ‘moving in’ with her. Trinket got bigger and fluffier as she grew. During this time, I noticed Chainsaw had a minor head tilt and some slightly odd behavior. Upon seeing the vet, we learned she had gone blind due to cataracts. Close observations of her in the cage showed she was still managing fine, so the vet and I weren’t too terribly concerned. Then a month or so later, I noticed a scratch on Chainsaw’s eye. A vet visit later, and we had an ointment to put on the eye to help it heal and fight off infection. Things, of course, got more complicated. The eye started turning white, bulging, and drying out (I can’t find any of the pictures I took of it, which I wish I could share as I haven’t seen anything quite like it on the forums. Closest is Pistachio’s bulging eyes seen in this thread:http://www.guinealynx.info/records/viewtopic.php?p=158#158). Another vet trip, and it was determined that the best option would be to remove the eye. I am super grateful that the vet I had chosen had a small animal surgery specialist on staff! The eye removal went well, and Chainsaw was up and eating within an hour after waking up from surgery, to the great surprise of the vet staff. Recovery continued in much the same manner, rapidly and with no complications. That first day back after surgery I tried separating Chainsaw from Trinket for the first day or so, but they were having none of that. After about 10 minutes of Trinket trying to tear the cage wall down while Chainsaw talked to her from the other side, I took the barrier down. Thankfully, Trinket didn’t trouble Chainsaw’s recovery at all. And then a week later I noticed a scratch on Chainsaw’s remaining eye. Back to the vet, and with this eye the vet saw that the cataract, causing Chainsaw’s blindness, seemed to have detached from the lens of her eye. It was assumed that this cataract, floating around in the eye, was causing pain and leading Chainsaw to scratch at her eyes. It was again determined that the eye would eventually have to be removed, though it hadn’t reached the same bulging, drying out state as the other. 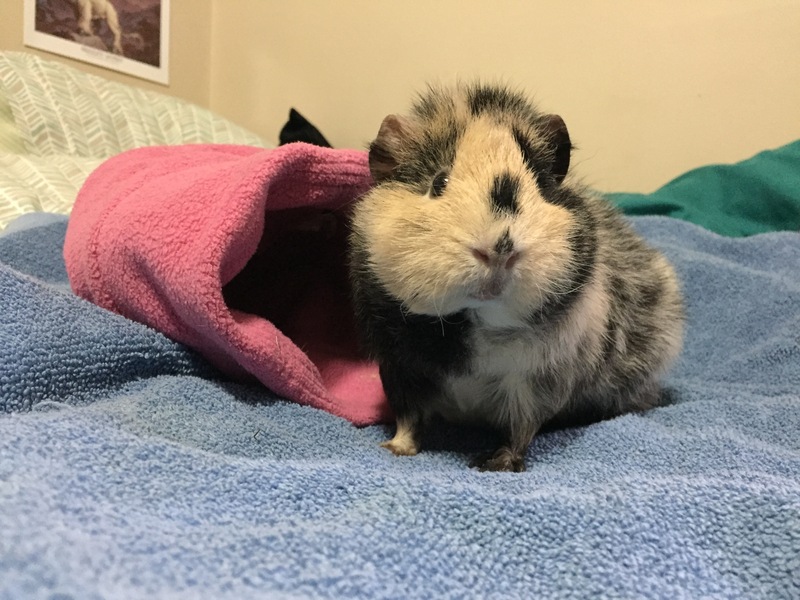 Since the first surgery was so successful and she was recovering well, Chainsaw had her other eye removed the next day. She has since adapted to life with no eyes, especially since she was blind beforehand. My brother nicknamed her a ‘double pirate,’ and said I should get her some eyepatches. Life continued for Trinket and Chainsaw. Their dynamic changed some, as Trinket was now a proper adult and Chainsaw was older and, well, blind. Shortly after Chainsaw’s surgeries Trinket decided she was now Boss, and Chainsaw just went along with it. 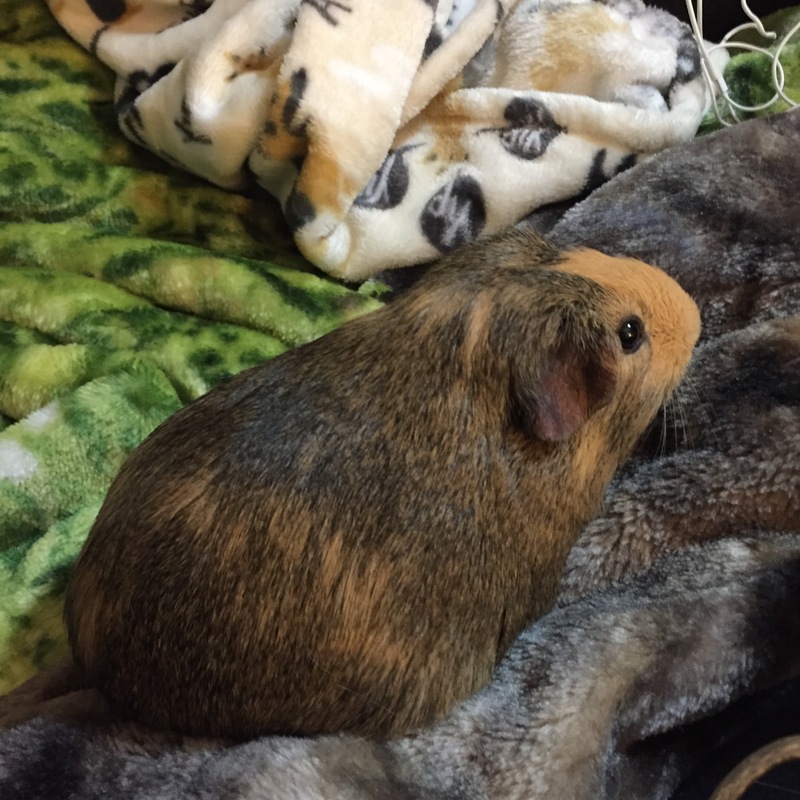 November of 2017, I adopted a new pig to add to the group, Penny. She came from the animal shelter in my parent’s hometown, estimated to be between 1 and 2 years old (so about Trinket’s age). 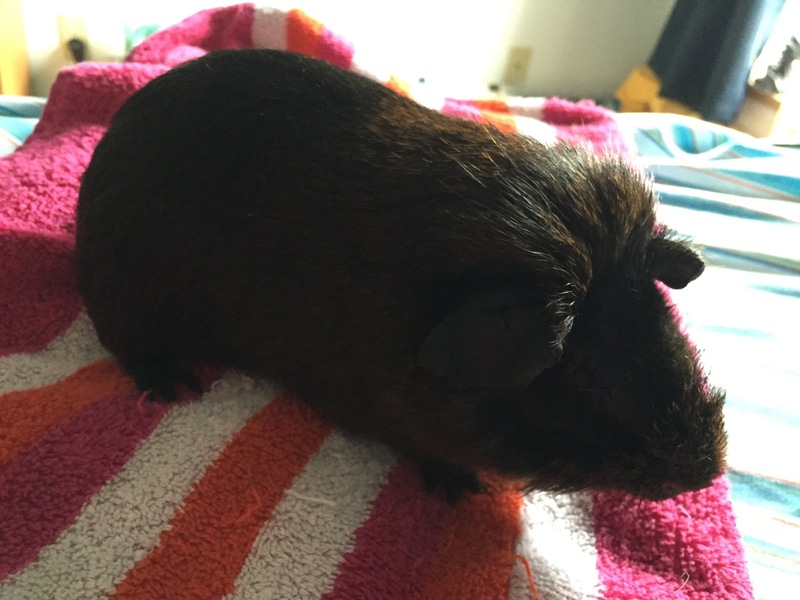 According to the shelter, she had been kept in a rubbermaid tub her whole life, and the last few weeks before being brought to the shelter had been with a male pig, neither of them neutered. By some miracle, she wasn’t pregnant. She was, however, deeply malnourished and vitamin C deficient. I managed to track down her vet records for my own files, and she was at one point only 240 grams! As she currently hovers around 800, that’s hard for me to imagine! Penny was very small when I first adopted her, and she’s already gotten much bigger. She’s still smaller than Trinket and Chainsaw, but she’s definitely much healthier and happier. I spoke to her foster family from part of her time at the vet (since she needed hand feeding every few hours for a while, it was determined fostering her with a volunteer would be best), and they commented on how much bigger she was too. Penny and Trinket get along like house on fire (that is to say, very well). Chainsaw and Penny have had a bit of trouble determining where they stand with each other, as Chainsaw has the more dominant personality but is also blind, leaving them a bit confused, I think. They seem to have worked it at this time, though I couldn’t say what they decided. 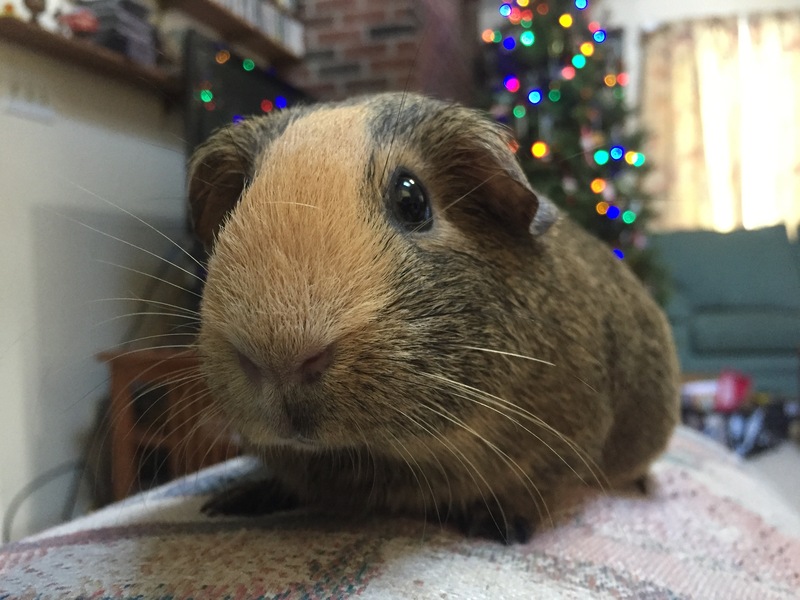 Penny is easily the most affectionate of the three, loving lap time and putting up with long snuggles much more readily than Trinket, who would rather explore than sit in your lap for more than 5 minutes. Currently, they are all getting along well and are cute as ever. Chainsaw is having some trouble with her left eye socket, which, seven months after surgery, started weeping puss (Thread on that over here, if you want to check that story out viewtopic.php?f=2&t=76139&sid=b98fcf36076662a9030737662be79f6f). Still, she no longer seems to be in pain and is eating (and screaming) as much as she ever has, so fingers crossed. Cute story and pix. You go, Chainsaw! 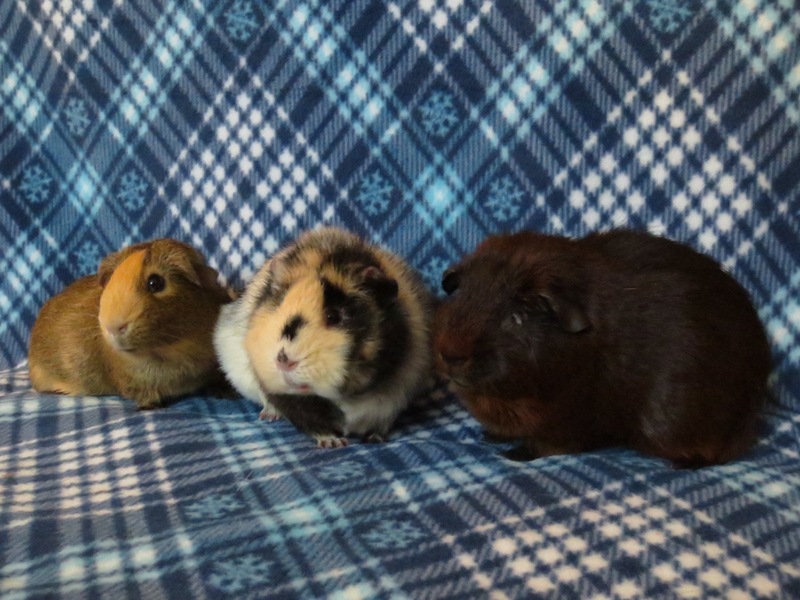 They are great guinea pigs! And you are a wonderful caretaker! 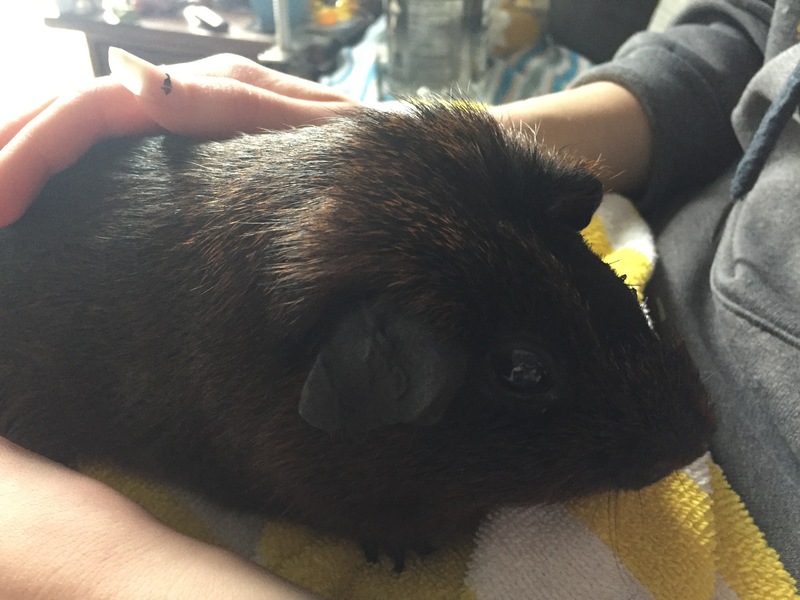 It does indeed sound like you have a good grasp of "proper guinea pig care". I hope Chainsaw's eye clears up. Thanks, bpatters and Lynx! I'll let Chainsaw know she has more well-wishers. Add one more to that list! I have to say: those are 3 extremely cute babies you have there. What a wonderful story! Such pretty pigs. Sorry to hear about Opal. RIP little lady. Forever in your forever home. You found love and peace in the end! So glad Chainsaw has made it through 2 operations. Hope the infection clears up and can't wait for more! Love Trinket's little water shape marking on her nose!